This weekend I’m performing in my first aerial silks recital. I keep going back and forth trying to decide if signing up was a good idea or a terrible idea. 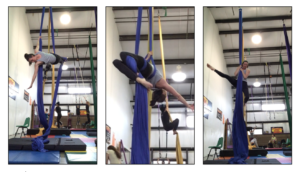 I’m one of the very oldest people who trains at the studio, and there are definitely days when I think that maybe I’m too old for circus arts. On Sunday, when I do my routine, most of the audience will be the parents of the other performers. In other words, the audience will be made of my peers. Am I going to look stupid? Is this going to be one of those cringe-worthy moments? Are those other parents going to wonder what the heck this mom-lady is doing performing with their children. I don’t know. It’s possible, but I’m doing it anyway. In the (many) years since I was doing ballet, I’ve missed performing. Doing book events is a kind of performance, but it’s not quite the same as training for weeks to put on a show designed to transport the audience to another realm. I’m pushing out of my comfort zone. I’m not an adrenaline junkie or a big advocate of risky behaviors, but I do think that fear holds us back from taking risks that might be transformative like traveling to a new country or volunteering with a new group of people or writing a book, for that matter. Sometimes change feels too huge and too dangerous for any of us to have the audacity to take it on (um… current political landscape, anyone?) but I try to consider the other side of the scary thing. Will I regret not having tried? What would it mean for me to fail? What could it mean to succeed? I’m stubborn so usually I decide that I would rather do the scary thing than sit around wondering what might have happened. What might happen if you pushed out of your comfort zone? Good luck this weekend Amber, and have lots of fun! I am a kindred spirit in pushing the comfort zone. I feel without doing so you cannot grow. Succeed or fail, you will have known you have the strength to try. I participate in a martial arts class which I like to simply call “ninja” because it’s more fun. There are many days I wonder if I’m too old to be donning MMA gloves and shin guards and bouncing around the mats with bigger, stronger, younger, healthier classmates. But the enjoyment overrides the fear. Push that envelope! And have a great time up there. You are so very cool and badass! I love that you are doing this and will be cheering you on virtually!